I absolutely regret buying it. There is absolutely no storage room in it. Has a push start but no place to put the key unless you either take up a cup holder or put it above the gear shift and have it go flying into the floorboard with the slightest turn. Forget putting it in the small hole in the door because unless it is closed the car does not pick it up and will not crank. The material on the seats is awful, the slightest bit of moisture and it looks completely unkempt as if you split a soda or something and then you have to wet the entire seat to get the color to match again. Then there’s always the fact that when you touch the gas it acts and sounds like a go cart trying to get up and go. Oh and you cannot leave the car running and be able to lock the doors from the outside so forget being able to pump gas with kids in the car. If you are looking for something roomy but compact, this is the car for you. I live how roomy the interior of my vehicle is while not being a big car. I was looking for a smaller SUV when looking for a vehicle to purchase, and ended up deciding on my hr.-v, which is a crossover. I travel and go on many outdoor adventures and my vehicle has been able to travel far distances with no problem. I also love the eco mode available in my vehicle, which lets me know when I am driving efficiently to save gas. Out of all the cars in my household, mine is known to waste the less gas when it comes to our adventures. The seats fold completely down, to make plenty of room for all our camping supplies, which before. We had to take more than one car to take all our things. Everyone that gets in my car comments on how cute it is, or how much more space they have inside than they believed. 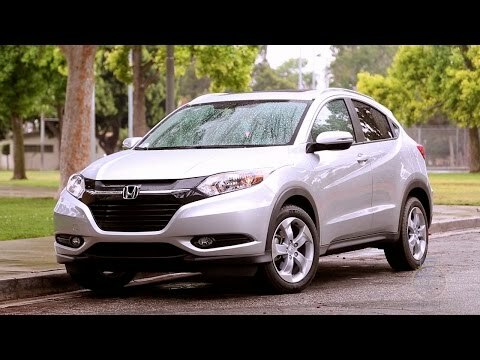 The Honda HR-V is a great, versatile vehicle for the money. The Honda HV-R is a the perfect vehicle for someone looking for the easy drivability of a sedan, but in a crossover package. The vehicle is very spacious, yet does not feel like a large vehicle on the road. The built in backup and passenger side cameras are amazing added safety features that I cannot imagine living without as it makes lane changes and backing up so much easier. The eco mode option on the vehicle allows for good fuel economy, especially in stop and go traffic in the city. I also really enjoy the all wheel drive for the winter months or going off-road.